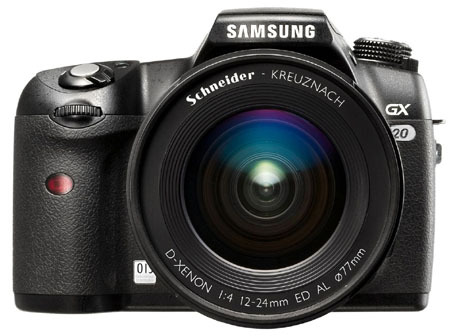 Samsung has followed its GX-10 digital SLR (DSLR) with the GX-20, which is the first DSLR to feature an image sensor manufactured by the South Korean colossus. The company claims that by producing its own sensors, its cameras benefit from reductions in size and pricing across the board. The GX-20 still comes with a £700 (€940/$1360) price tag though, but that does include an 18-55mm lens. The GX-20 builds on the GX-10’s 10.2 million pixels to offer a 14.6-megapixel sensor. But it only replaces the GX-10’s 2.5in display with a slightly larger, wide-view 2.7in LCD. It also has an optical viewfinder. 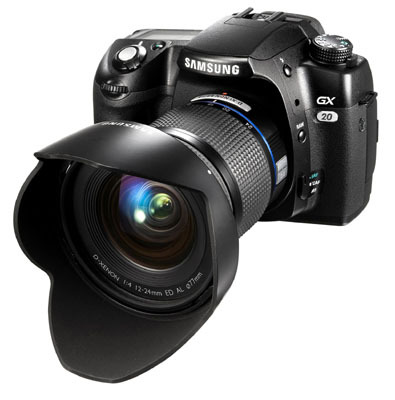 Blurred images shouldn’t be a problem, because Samsung claimed that the GX-20’s able to physically shift its CCD to counter any movement of the camera’s body both horizontally and vertically. For example, if you get the shakes during a celeb photo shoot and the camera moves to the right, then its CCD will move to the left by the same degree. This, Samsung claimed, eliminates the need for anti-shake circuitry. Likewise, if you’re shooting on a breezy, rainy hillside then you'll be glad to know that 72 potential access points for grime and dirt have been sealed off. It also has a top ISO sensitivity of 6400, which is significantly higher than the GX-10’s maximum sensitivity. A one-touch RAW button’s built in, enabling you to view RAW format pictures on the display and convert them into JPEG through a built-in convertor. When shooting in RAW, you’ll be able to capture up to nine frames per second (f/s), but that drops to 3f/s when you opt for JPEG. There’s barely a fag paper between the maximum image sizes each mode can capture, though. RAW mode will get you a 4688 x 3120 resolution shot, whilst JPEG mode produces 4672 x 3120 snaps. The camera accepts SDHC memory cards of up to 4GB, the contents of which can be transferred to your PC via the built-in USB 2.0 port if you lack a suitable card reader. You can get your mitts on the Samsung GX-20 from March.